I apologize, my lovely readers, for my lack of attention to the blog these past few weeks. The month of December was so busy for us in the kitchen that I had barely any time to even write menus for my daily clients let alone answer emails or contemplate a blog entry. But it’s a fresh new year. And so many opportunities are ahead of us. Lots of good things in the works for my business, hopefully some fun new things personally and a whole world of new food and recipe testing. I love the start of a new year, everything feels fresh and like anyone can conquer the world and do ANYTHING! That being said, this first entry is one of my favorite soups because it is so simple, so clean and can be made insanely quickly. With or without the shrimp it is a clean yet still comforting soup for these chilly days we’ve been seeing in Chicago. You can fancy it up with a drizzle of brown butter, you can change up the flavor with a swirl of harissa, you can keep it vegan and throw in some olive oil browned tempeh cubes. The possibilities are endless! So enjoy this new soup all while contemplating the incredible world that is ahead of us in 2015. And I can’t wait to see what is in store for myself as well as you all. Happy New Year! white truffle oil, about 1-2 T.
Preheat a 4 qt. sauce pan over medium heat. Add a good swirl of olive oil and heat another 30 seconds. Add the shallots and saute until translucent, about 3-4 minutes. Add the cauliflower and potato pieces to the pot and stir to cover lightly with oil. cook another 4-5 minutes until fragrant. Add the bouillon cubes and pour in water until just barely covered. Pop the lid on and simmer until the vegetables are tender. Meanwhile, bring another pot of water to boil with the halved lemon. Add a hefty pinch of salt, the halved lemon and some whole peppercorns if you have them. Simmer the water 10-15 minutes. Add the shrimp and cook for about 2-3 minutes, depending on the size, until cooked through. They will be opaque and bright pink. Remove from heat and dice into bite size pieces and set aside. Or if not using right away add to a bowl with ice and cool water to stop the cooking process. When vegetables are tender, add them to a blender along with another 2 T. olive oil. Puree adding just enough liquid to keep the blades moving but not too much (you don’t want watery soup!). Taste for seasoning and add more salt and pepper as needed. Ladle into bowls, divide the chopped shrimp evenly, sprinkle with the chive. Finally, finish with a nice drizzle of the truffle oil and a few red pepper flakes. 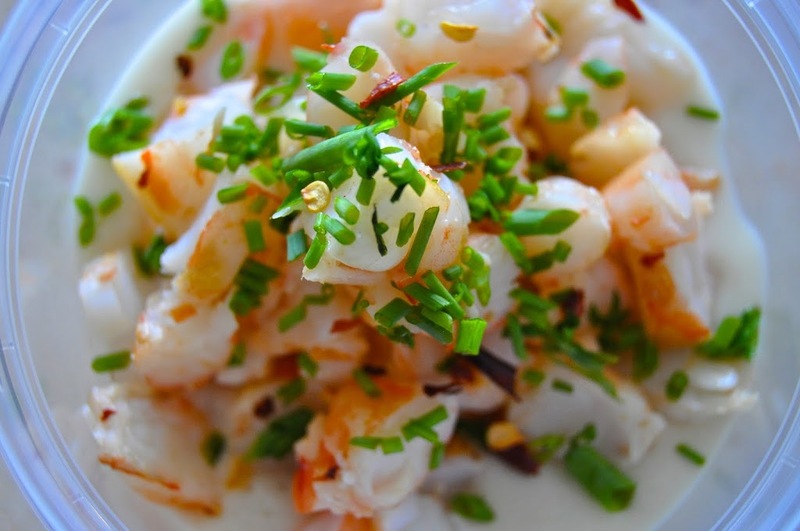 *To make shellfish free-simply eliminate the poached shrimp. The soup is equally as delicious!